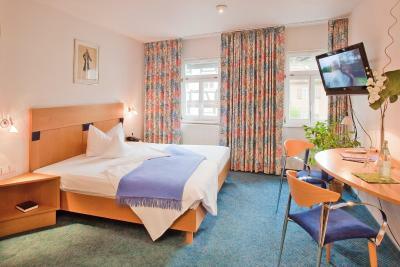 Lock in a great price for Hotel Kronprinz – rated 8.2 by recent guests! The staff were very helpful, even arranging for me a late arrival after the reception was closed. They speak English very well. 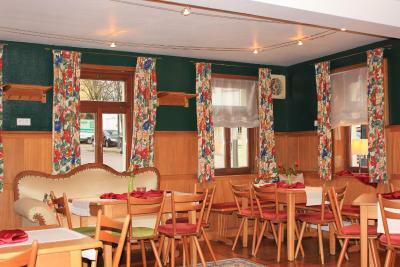 The hotel was convenient to local restaurants. Great location on the edge of the old town. Friendly, helpful staff. Comfortable room. Close to the train station. The staff were very friendly and extremely helpful. Friendly English speaking staff, good walks for the dog nearby. Excellent breakfasts. 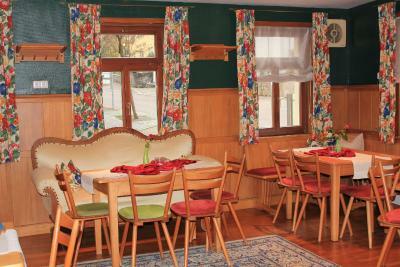 Furnishings and equipment in main areas attractive, lovely breakfast room and small restaurant. Gutes Frühstück mit Auswahl. Sehr bequeme Betten. Freundliches Personal . Die Lage des Hotels ist augezeichnet, es war sehr Ruhig und bis zur Brauerei, um etwas zu essen, waren es nur ein paar Gehminuten. 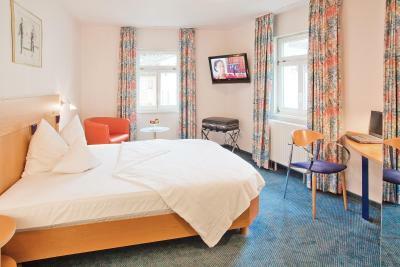 Die Hotelangestellten waren alle sehr nett und professionell. Das Frühstück war gut und frisch, wenn aber auch etwas eingeschränkt. Obwohl die Zimmer erst ab 15.00Uhr zu beziehen waren, durften wir schon ab 13.00Uhr das Zimmer nutzen. Die Lage ist sehr gut um als Fußgänger die wichtigsten Sehenswürdigkeiten zu erkunden. Familiäre Betreuung. Der schnelle Cheque-in, der freundliche Empfang, das gute Frühstück, die zentrale Lage zum Bahnhof. Der Blick über die Stadt, das Würth Kunstmuseum. Die Angestellten waren superfreundlich! Ganz toll! es gibt einen kleinen Wellness Bereich mit Duschen, Sauna, Solarium und einem Stepper sowie zwei Wellness Liegen. Auch sehr nett nach einem Arbeitstag. Das Zimmer war groß und sauber und es war alles da, was man braucht zum Wohlfühlen. 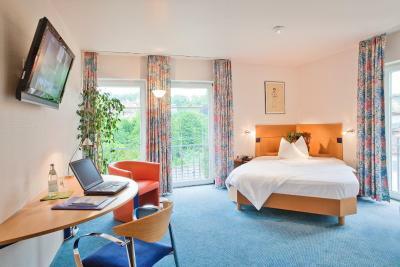 Hotel Kronprinz This rating is a reflection of how the property compares to the industry standard when it comes to price, facilities and services available. It's based on a self-evaluation by the property. Use this rating to help choose your stay! 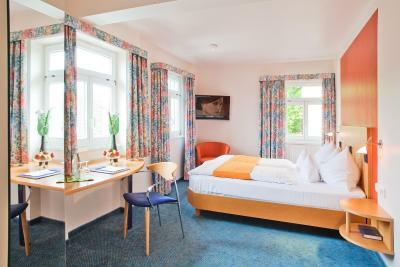 This hotel is located just a 5-minute walk from the train station in Schwäbisch Hall. 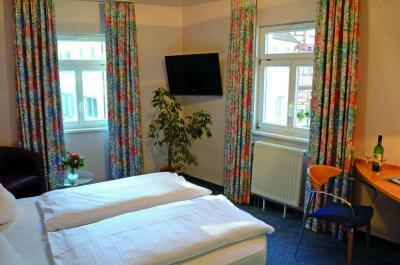 Hotel Kronprinz offers you comfortable rooms with free WiFi and wonderful views of the Old Town. 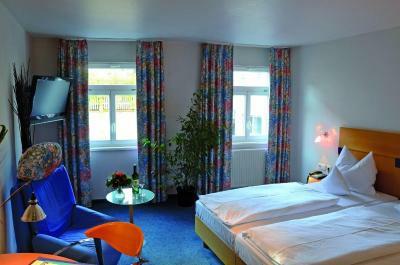 Enjoy your stay in these bright rooms with large windows and desk. The bathrooms include heated floors. 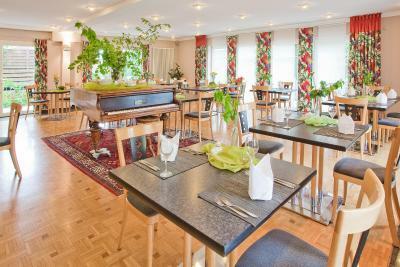 A wide range of cuisine is available, from regional dishes in the cozy hotel pub to modern, international meals in the restaurant. 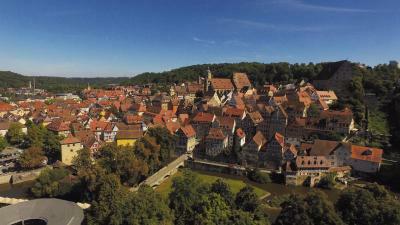 The lively Old Town and the Kunsthalle Würth art museum are just a short walk from here. Between sightseeing trips, relax in the welcoming spa area. Located in the building’s historic cellar, it includes a sauna and relaxation area. 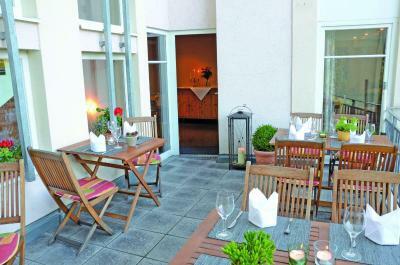 Parking is free of charge to all guests staying at the Hotel Kronprinz. 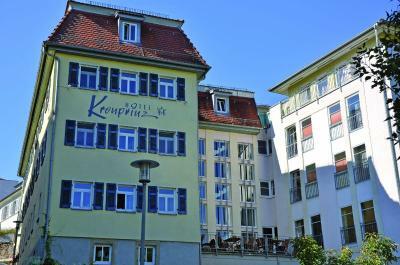 When would you like to stay at Hotel Kronprinz? 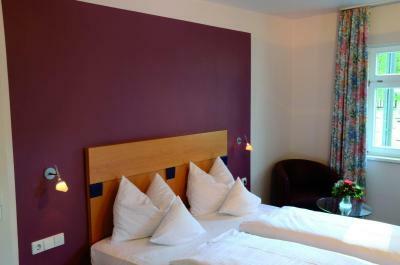 Bright room with a queen size bed, work desk, flat-screen TV and private bathroom with heated floors. Includes 1 complimentary bottle of mineral water. 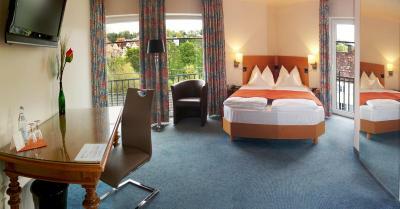 Bright room with a queen size bed, windows, a flat-screen TV and desk. The bathroom includes underfloor heating. 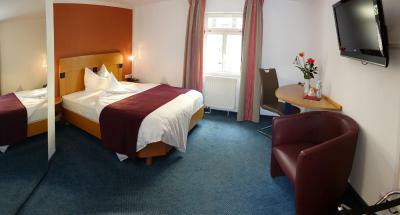 Bright room with a single bed, flat-screen TV, large windows and desk. The bathroom includes underfloor heating. This single room features a bathrobe. 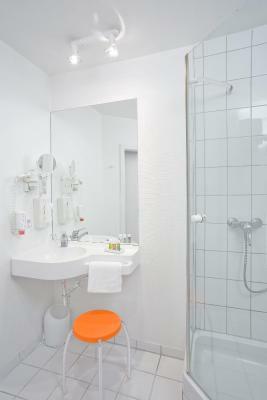 House Rules Hotel Kronprinz takes special requests – add in the next step! Debit card Hotel Kronprinz accepts these cards and reserves the right to temporarily hold an amount prior to arrival. Hotel Kronprinz accepts these cards and reserves the right to temporarily hold an amount prior to arrival. Please note that the restaurant and bar are usually closed on Sundays. Drinks can still be ordered on room service. Please also note that parking is available and located 250 feet away from the property. There is a daily charge of EUR 8. There is limited parking, so I had to park at a nearby parking garage for about 4.5 Euro / nt. 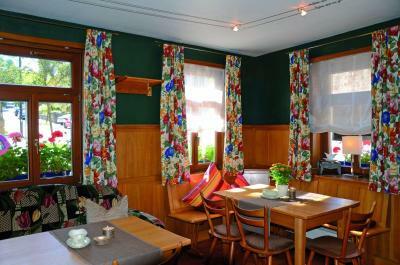 The room windows are dormer style, and the curtains don't completely block the sunlight. Very misleading that they offer free parking: they have some (max 10 spots) at the back of the Hotel but not enough. I had to pay for my own parking (~7€/day). I paid 89€ for one night, midweek. The room was very small and just functional but at least cold (heating took roughly 20mins to solve that problem) and tidy. 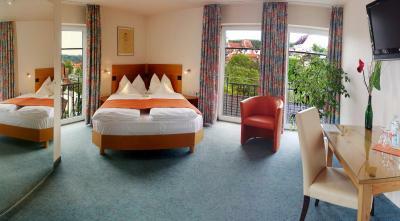 I wouldn't have complained had I paid 50€ or Maximum 60€ for the room. For a 90€ room I expect parking to be included, a more tasteful accomodation when one thinks we are not talking about renting a room in Barcelona, Paris, London or Rome. Very convenient near the station. WIFI didn't work in the room. No mini bar no safe no air conditioning, bathroom rather shabby, carpets faded and grubby near the windows, Wi Fi not that efficient. No where near the centre of town. We wanted to eat in the hotel restaurant but were told on our first and last evening we could not as they had a party in. Hotel closed on Sunday.